Keep your team on top of their game! Staying up to date with the latest tricks can be difficult and time consuming. With PentesterLab PRO enterprise, your team member can quickly learn the latest technics and vulnerabilities. We provide on-going training! Like infosec, our content keep evolving all the time. 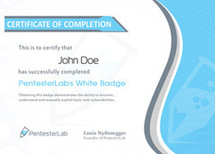 With PentesterLab PRO Enterprise, you can train your all team for a fraction of the price of usual security trainings. Get a quote now, you won't be disappointed. No affiliation (just a happy customer) but @PentesterLab Pro is the best bang for your buck for learning advanced web pen testing. Provide us with your details and we will email you a quote within 24 hours. Note: You can share the license between members of your team to train more people. This allows you to move the license around if someone joins or leaves your team as well. The licensing is based on the number of users with access at a given point in time. This allows you to easily rotate the license within your team to make PentesterLab PRO one of the key elements of your onboarding process. Who is using PentesterLab PRO Enterprise? PentesterLab Pro is used by multiple Banks, Universities, Audit firms, Government agencies,Pentest Boutiques... All across the world! Your team will gain certificates of completion of every badge they finish. You can easily track their progress in the enterprise view. We have already issued 11099 certificates of completion.